Teams picked up page 2 of a will that came folded with many horizontal and vertical folds into a 6 by 10 rectangular grid. The answer to each puzzle in this round began with one of the letters used to represent the 12 pentominoes. The text of the will referred to giving away many favorite items and specifically indicated 12 favorite items to be given away. Each answer in the round could be matched to one of the favorite items in the will. 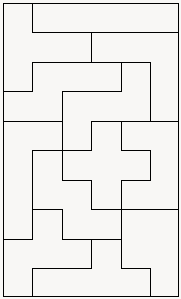 The will could then be divided into the twelve pentominoes so that each word "favorite" (preceding each of the 12 favorite items) was in the pentomino that matched the shape of the initial letter of the answer that matched the favorite item. This configuration is shown below. Each rectangle in the second and fifth column of the grid had a number in it. Using the numbers to index into the answer corresponding with the pentomino that went over that rectangle gave the motive OTTO BROKE DOWN HIS WILL.